Picnics are one of my very favorite things about spring and summer time. When I am just at my wits end with the cold and snow, I start to dream up all the various places I will take the kids to picnic. With the weather turning absolutely gorgeous the last few days and my new backyard finally worthy of being called a garden, I was excited to stay home and enjoy a family picnic out back. It was a special day as it happened to be the anniversary of the day I met Mr P in Mexico, thus, it became our anniversary family picnic. What’s an anniversary family picnic without some roses and little hearts!!! Me, trying to learn how to be more creative with my photography. What do you think? 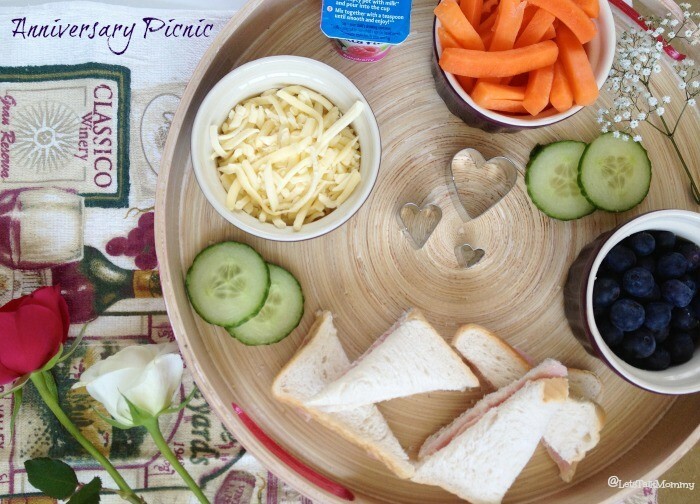 Other than the above added pretties, it was a normal lunch put on a tray for us to all enjoy out on our picnic blanket. The grass had dried out from the week of rain we had and butterflies even appeared in our new flowers. It was a great feeling to look around and see all that we have recently created, pure beauty. The kids were so excited when they saw me walking towards them with this big buffet of food for them. Missy Moo was bouncing up and down with anticipation, we all know how much she loves her food. Buba was even shouting, “is this for me, Mommy?” I laid it down in between them and in no time at all they both were scarfing it down. They looked so grown up feeding themselves and even a few times handing the other one something from the tray. I was worried that Buba would try to score all his favorites first, i.e. the blueberries but he was so good to make sure his sister got equal amounts. It really impressed me. I am ever so excited that picnic season is upon us now. Lately, we have even been having our morning and afternoon snacks outside, picnic style. When it’s sunny, do what the romans do, bask in it. Is that a real saying? Doubtful, but it is now! 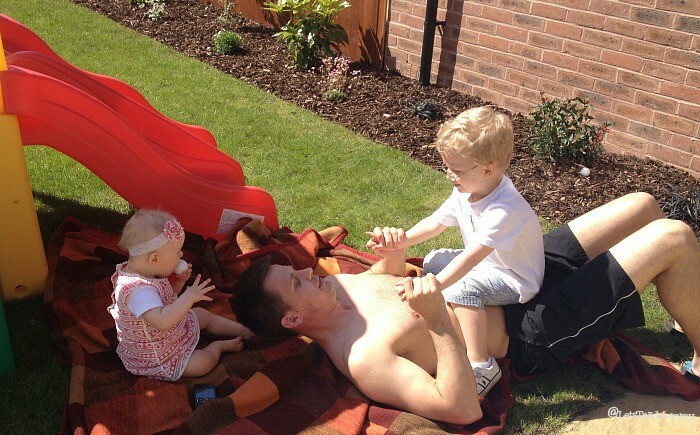 I am loving my backyard and being able to be out in it with my family, having fun in the sun, is amazing. Missy Moo was eating long after everyone else had finished and Buba had moved onto playing with his slide. I love how she has her feet crossed here like a lady yet both hands are full of various items from her tray ready to stuff all in her mouth at once. That’s my princess!!! After our anniversary family picnic, we continued enjoying our new backyard. Daddy played row, row, row your boat with Buba while Missy Moo secretly chewed on Daddy’s golf ball behind him. Everyone was in a good mood and enjoying the nice weather. It’s times like this I love the simple things in life, ordinary moments that are great memories made, as a family. All I did was throw some fruit, vegetables, and sandwiches on a tray and served them on a blanket outside for the kids. But to the kids it was a mini great adventure. They were in the best moods all day and lately I have found that they aren’t as grouchy when we are all outdoors. To me, it was a special day with Mr P and watching our two kids together, knowing meeting seven years prior in Mexico brought us all of this! I look forward to having as many picnics, and snack times as I can with the kids, out in our garden, making ordinary moments, moments to remember!!! Ah Jenny I love this post. I can’t believe how nice the weather has been this weekend, doesn’t it just make everyone so much happier and funnily enough it is when the ordinary moments become so much more special. Ahhh thanks Katie, yes picnics definitely the way to go if its’ nice out. Thank you I still have so very much to learn. But glad people are noticing my new creative photos too! Not sure if they are working or good but got to start somewhere!!! 🙂 Thanks for hosting lovely. I love the photo of your picnic tray, it looks very pretty and inviting. Wish my food photography was better, it’s so hard to compose the shots! You little girl is so cute munching away. M is getting to that stage where he’s a little more cautious, a little too distracted by all the fun stuff to play with to concentrate on food. I try to stay relaxed about it, but there is something really satisfying about watching a wee one just enjoy their food! I am just learning how to take better food photo as I was so disappointed in my old ones. I went to a blog conference and Capture by Lucy gave a talk about it and using props. She is amazing if you haven’t followed her blog or instagram yet, do she is so inspiring and has HELPED ME LOADS!!! Thanks for the lovely comment. I was the same with Buba as my first child and not eating but I was told it doesn’t matter what they eat in one day it’s what they have consumed over the whole week. So Buba may not eat almost anything one day and make up for it the next. 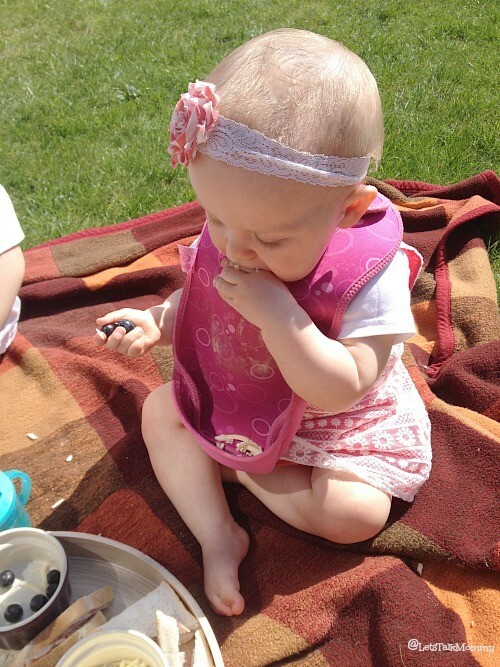 Picnics are the best – a nice easy clean up for us Mamas too! We had picnic lunch on Friday, and lunch and supper on Saturday and Sunday and it was wonderful – food always tastes better outside! I agree Carie it really does always taste better outside and in the sun!! For sure!!! Thank you Sarah, I have been trying to learn how to take more creative stylish photos rather than just on a plain plate. Glad it’s starting to show that I am improving a little. hahaha We love picnics and even our morning and afternoon snacks outside. So lovely in our new garden. My garden last mini phase will be up on my blog soon. Stay tuned to have a peak. Thank you. We are huge fans of picnics no matter where they take place outside or in the park!!! Beautiful post Jenny, what a glorious day for a special picnic. Glad you’re getting to enjoy all your gardening efforts. Thank you so much. It was a glorious day indeed!!! It was nice to be able to fully enjoyed all my hard gardening work. Wish the rain would go away again so I could get back to enjoying it. Thank you yes we really enjoyed it. Picnic season is the best.